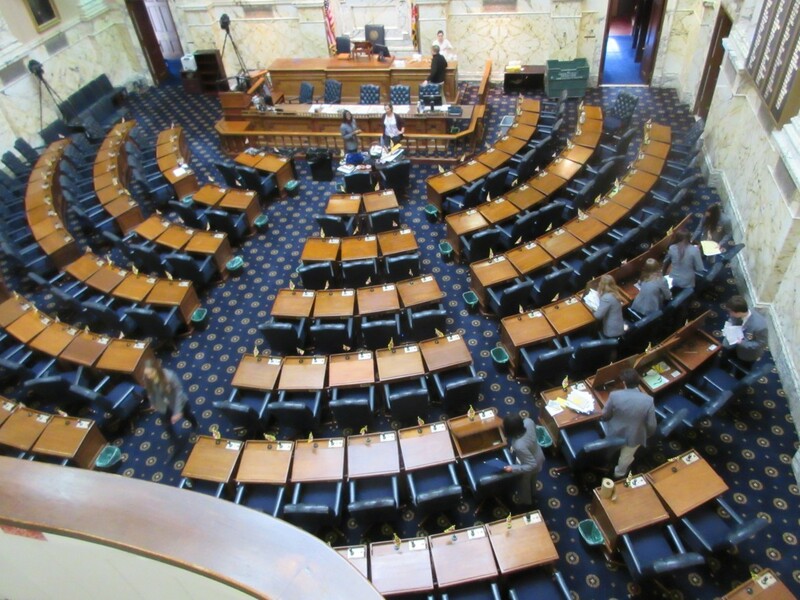 Photo above: Pages clean out desks on floor of the House of Delegates on Tuesday afternoon. Congratulations on a hard-fought election to become Maryland’s next Governor. Your promise to “Change Maryland” resonated with hundreds of thousands of voters — especially your belief that middle-class residents and working families deserve tax fairness and job creation. We agree. But as you know, with hundreds of millions of dollars of revenue shortfalls, we will have to make tough choices to spend within our means. That’s why we’re hoping that we can join together across party lines to put middle-class Marylanders (and those striving to become middle-class) first. We believe that growing our state’s economy and improving economic security for all Marylanders are goals that stand together. Economists are telling us that stagnant wages and income inequality are hampering our rebound, and we need to expand our economic recovery to include hard-working Marylanders who have not felt it yet. Make Virginia Jealous of Our Transportation & Energy Infrastructure: You have frequently and passionately discussed keeping Maryland competitive with our neighbors. At the same time, a General Assembly work group recently studied ways to improve our state’s business climate. One of the common desires raised by businesses was the need for Maryland to invest robustly in our infrastructure. The opening of the WMATA Silver Line to Dulles is projected to bring billions of dollars of investment and thousands of jobs to our neighbors, and Virginia isn’t stopping there. Maryland should focus infrastructure investments on the most leveraged areas for economic growth. Moreover, our growing renewable energy infrastructure is fueling millions of dollars of economic activity and investment. Let’s create jobs by building modern transportation and energy infrastructure to serve our people and grow our economy for years to come. In doing so, we can also provide cleaner air and less traffic for our families. Keep the American Dream in Reach: To keep neighborhoods viable, encourage economic investment and maintain pride and faith in a community, we need to invest effectively in public schools. Several counties throughout Maryland are confronting surging school enrollment and/or deteriorating buildings and overcrowded classrooms for our children. Meanwhile, many young people who graduate and work toward a college degree face historic financial hardships. Businesses in Maryland require an educated workforce, and local tax revenues rely on maintaining strong public school systems. Let’s work together to continue providing a world-class education to all Maryland children, align workforce training with state business needs, and rein in college tuition rates to keep the American Dream in reach of all Marylanders. Ensure Everyone Pays Their Fair Share: You ran with a focus on reforming Maryland’s tax code, and we think tax fairness is a very important issue. An effective start would be to first make sure we’re all playing by fair rules. Currently, large corporations who do business in the state are able to evade taxes by booking work done in Maryland to states with lower rates. Twenty-four states — including Texas, Alaska, West Virginia, Arizona, Kansas, and the District of Columbia — have already closed this corporate tax loophole. Adding Maryland to the list would be a good first step in ending a system where multi-million dollar corporations can pay less in taxes than small businesses and middle-class Marylanders. Ending corporate tax evasion would also add millions of dollars a year to the state budget, and there is no shortage of good that can be done for ordinary Marylanders with that revenue. Defend Family Values in the Workplace: Marylanders should be rewarded for working. We need to revise workplace laws to support family values and public health. Right now thousands of middle-class Marylanders have to choose between earning a paycheck and taking time off work when they fall ill, need to take care of a child or loved one, or become pregnant. Our state has yet to ensure that employers will provide their workers paid sick and parental leave, and that costs us all in terms of public health and expenditures. After all, economic crises for thousands of middle-class Marylanders mean higher service costs borne by taxpayers. Many of these residents simply want to work and be able to continue working under reasonable circumstances. Let’s support working Marylanders and their families. In closing, we know that you are as proud of Maryland as we are, and we are very proud of the substantial investments prior generations have made to give us a high quality of life in our state. We see our state as one with an unmatched level of service to its population, an impressively educated workforce, compassion for the disadvantaged, and a commitment to the success of everyone together. We know we may have some differences in the next four years, but let’s do whatever we can to work together to make Maryland the best state in the nation for middle and working class families to live and work in. We hope to brainstorm further ideas together and to join you at bill-signing ceremonies for many of the initiatives outlined above. * The lawmakers are listed in alphabetical order. All are Democrats.